No friends were harmed in the making of this screenshot. 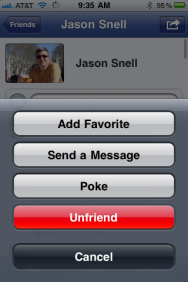 That’s right: Facebook version 3.4 comes with the ability to unfriend someone from your iPhone or iPad, along with a few other new features. For example, the update also brings a plotting option that displays your friends’ Places on Google Maps; users can click a thumbnail next to the place on their friend’s Activity tab and the app will pinpoint the location on the map. The Events tab also got an upgrade in the new version. Now, Facebook users can check in for events they are attending from their iPhone or iPad. In addition, the news feed has been improved, as has the notifications UI. Facebook is available for free on the App Store and requires a device running iOS 3.0 or later.